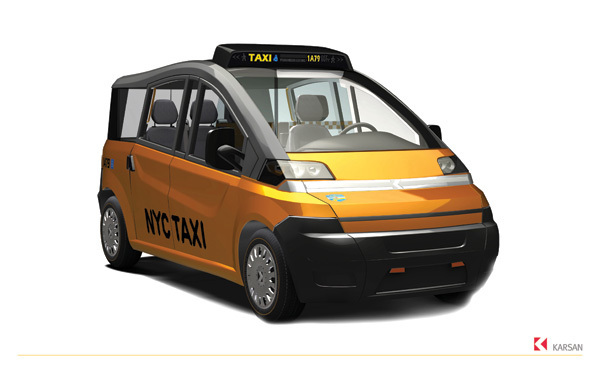 Turkish carmaker Karsan, one of three finalists in the city's "Taxi of Tomorrow" competition, plans to partner with an American automaker to build the powertrain for the vehicle that it hopes will be the next New York City cab, a source familiar with the company's plans says. The competition to custom-build an iconic taxi to replace the various models on the road today is coming into the home stretch, and Karsan hopes that a partnership with an American automaker like General Motors or Chrysler could allay concerns that it lacks U.S. manufacturing experience. The Taxi and Limousine Commission expects to announce a winner soon. Commissioner David Yassky has said that if none of the models measure up, the city could decide to postpone awarding the exclusive 10-year contract. Karsan on Tuesday night unveiled a model of its cab design to taxi industry executives at the Classic Car Club in Manhattan. The other finalists, Nissan and Ford, have not revealed details of their vehicles, though all three carmakers expect to build a van as the next taxi. The new car could debut as early as the fall of 2013. Ford's entry is a version of its Transit Connect, a small van on the road today. Nissan's model is based on its NV200, a small van produced for the Japanese and European markets. Karsan's cab is just a few inches shorter than Ford's Crown Victoria, the long stretch sedan that makes up the majority of the 13,000 cabs on the road in New York today. Karsan's vehicle has unique features, like a glass roof, a wheelchair ramp and wheelchair bay that replaces the shotgun seat. Its interior is spacious and offers possible amenities for cabbies, like a small refrigerator by the driver's seat.